So far so good on the computer/broadband front! Even tho I still await the replacement hard drive there's just too much stuff to catch up on (like the ABC Along for one) so I'm forging ahead! Thanks for all the support and empathy for the fact that I live in the Computa Triangle (hee!) Best comment from the last entry? Dorothy who asked if I had seen Jimmy Hoffa! Thanks for the best giggle in a long time D! Why don't bloggers make pictures able to embiggen? Now for some long awaited knitting content! Mods to pattern: changed from flap heel to yo short row heel with mini flap and gusset and used a standard wedge toe instead of the star toe used in the original pattern. Child's sock: 2 x 2 rib, toe up, using the Turkish Cast-On. YO short row heel. 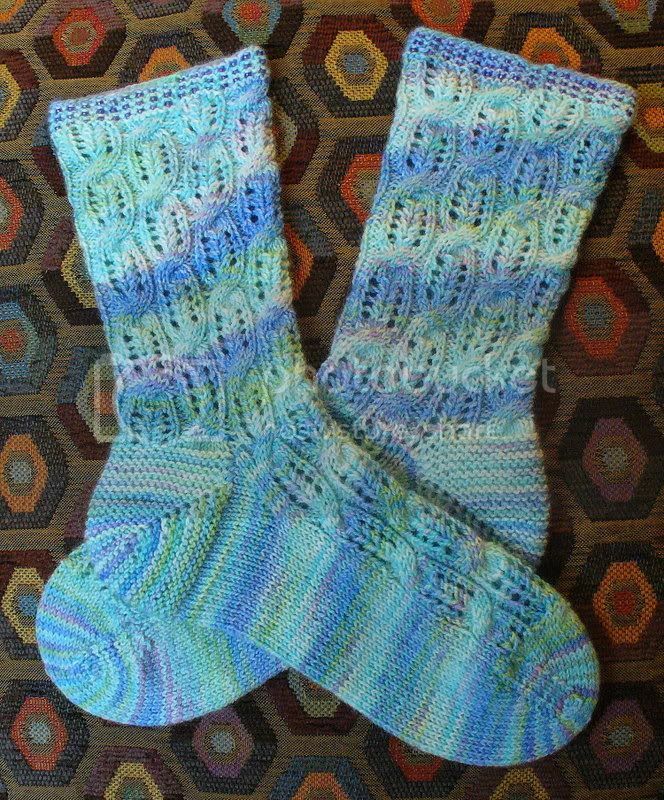 I adore this soft, richly colored yarn cause it makes the coziest, quick, handsome socks and the pattern is fun and easy! This is one and a half pattern repeats post frog pond visit. 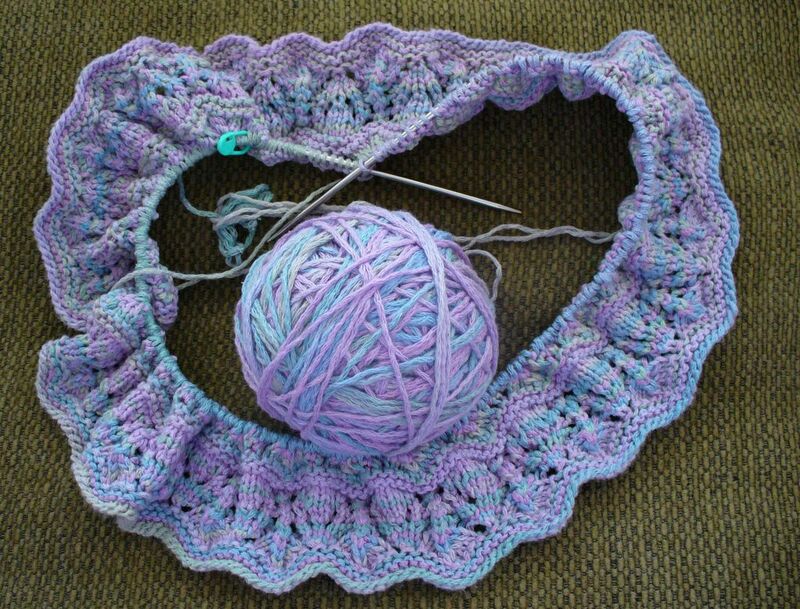 As many of you complimented when I posted her as the mystery birthday contest project, I LOVE how this yarn is working up in this pattern! It's Needful Yarn's Kelly in colorway #100. It's a soft, cabled cotton acrylic blend that knits up beautifully with fabulous stitch definition, comes in lovely colorways (and in solids too, called Kim) stands up well to frogging *blush* and is totally cheap with good yardage!! I'm very happy with this pattern so far altho I'm planning lots of mods but I'll share those when I have more progress to show! I like how these slippers came out altho I found the felting a bit tricky. It was very hard to get just the right size and work out all the unwanted lumps and bumps which matter much more in a slipper than a felted bag. The construction of these clogs is completely brilliant and a quick, fun knit that makes up a sturdy attractive slipper. My only complaint was that the suede bottoms were VERY hard to sew on and made me feel like my hands were bleeding while I did it! I'm not kidding, it was so painful to do I almost cried! If I ever make these again, I will get the paint on stuff for slipper bottoms and give the sew on ones a miss! 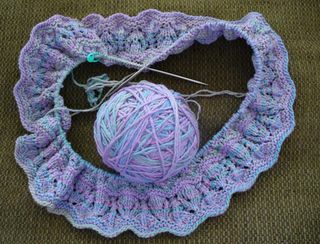 Otherwise I heartily recommend this pattern! Lolly has been kind enough to coordinate this fabulous event again this year! It's a cashmere merino blend sport/DK weight footie of my own design. I figure it was only proper for cashmere to kick off the Socktoberfest festivities and this is some very nice yarn! It's supposed to be a gift but it's so soft and such a lovely green, it's gonna be hard to give away, especially since Pumpkin's already in love with it! Whew! What a post, so much catching up! One last note....I've mentioned that I have no LYS so I do all my shopping thru Internet vendors. My favorites have a special place on my side bar and when I find a vendor that makes me happy I want to share it with my fellow knitters! If you want amazing, exemplary customer service, a real attention to detail, a great selection and prices, fast service and a professional who does everything with a vitual smile on her face head over to The Loopy Ewe and give Sherri a shout and you wont be sorry! She's simply GREAT!! She offers discounts, free shipping over $50 and lovely little gifts in appreciation of her customers and makes you feel like your business is her #1 priority unlike some other Net vendors! Plus she's got Claudia's Handpaint, woot! Go on, show Sherri the love! It's cooling off, the humidity is down, (AND NO "H"'s, WOO HOO!!) the sun is shining and the P-Man can't get enough of the glorious Florida weather! He's glad to be back and hope your week is full of sunshine and lots of knitting! You KNOW I had to enlarge all of your pics! VBG! 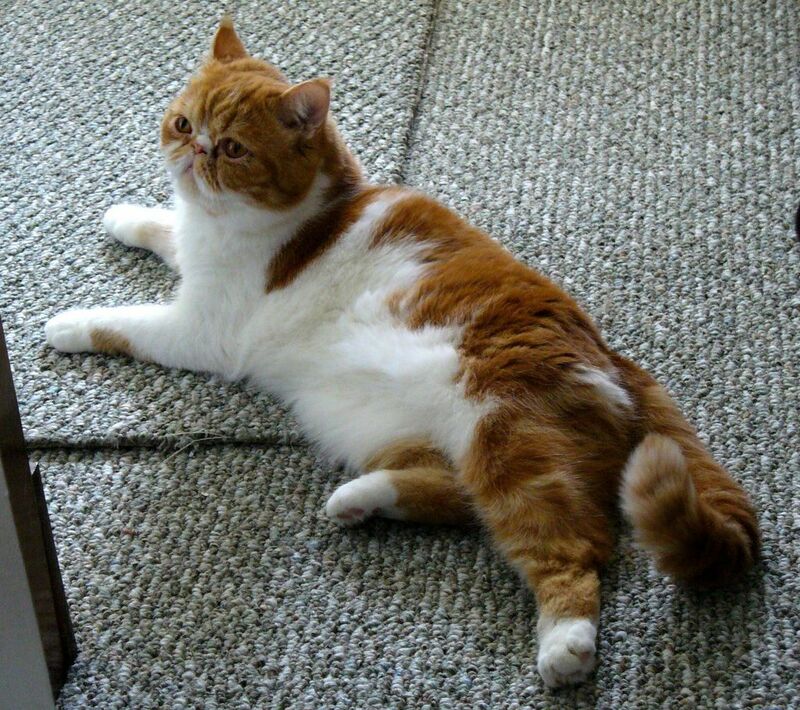 Tell P Man he looked great in his close-up! It's so good to see you back and posting again, I missed you. 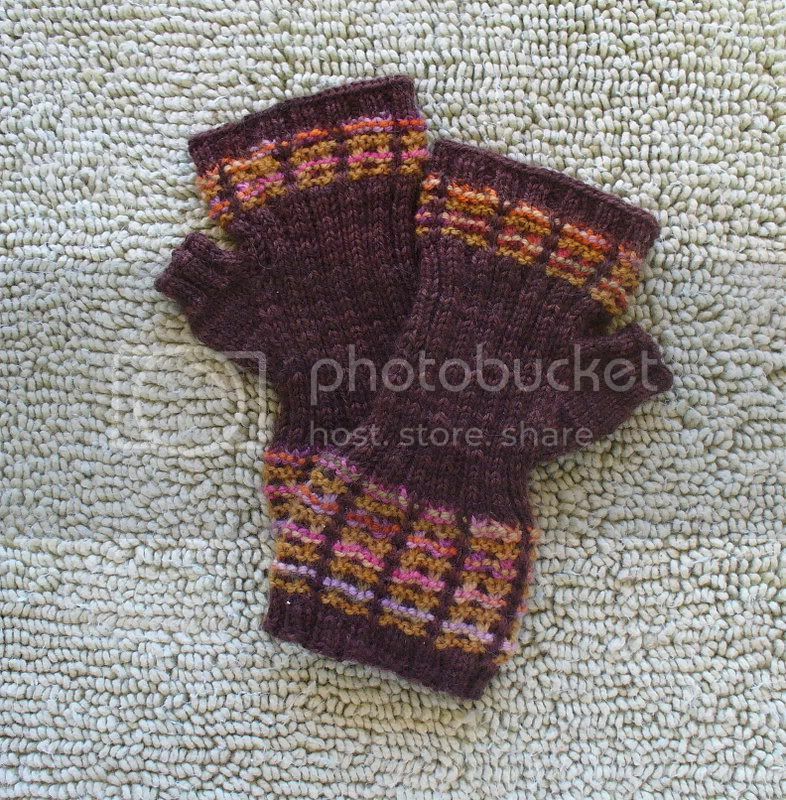 I LOVE those twined socks, they are now officially on my Socktoberfest list. The CIC socks are so cute. So glad you're back and all seems to be well. It looks at least as if you've been busy during the computer doldrums. I LOVE the cedar/cami socks. I've been looking for a color that my hubby might actually wear and that looks promising. Now I gotta go check my site - I have no idea if my pictures can be englarged. 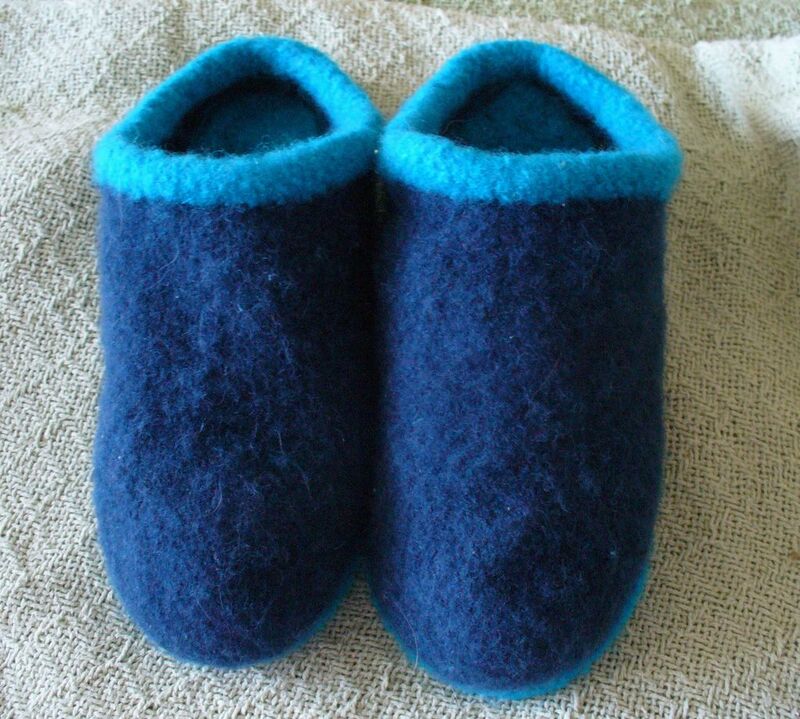 Those felted slippers look great! 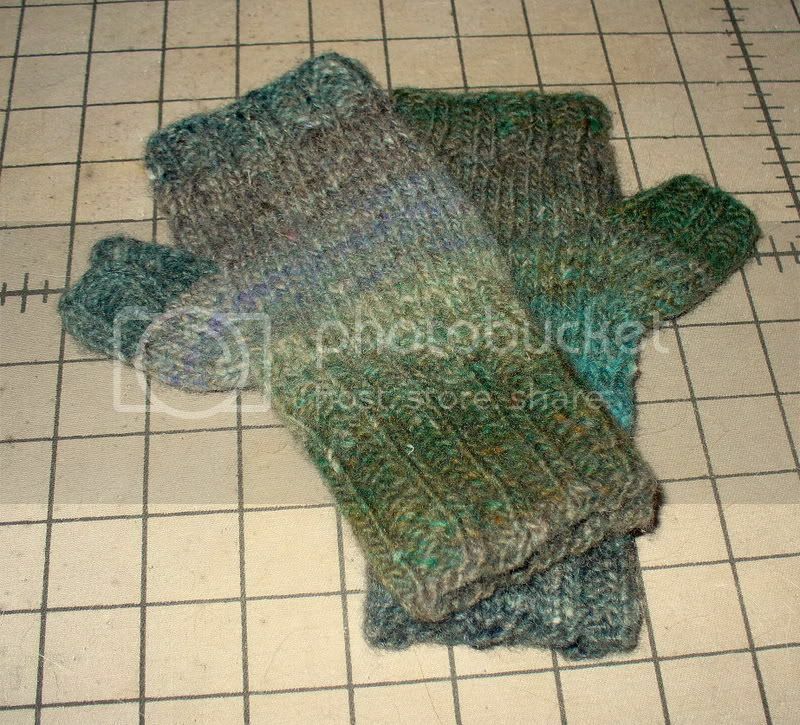 I've only made one pair and I was thrilled with the knitting and not so much with the felted product. Felting just doesn't work for me. You covered a lot of ground here! And it's all good and I'm so happy to see you posting again. Wow! You did pack a lot into that post! 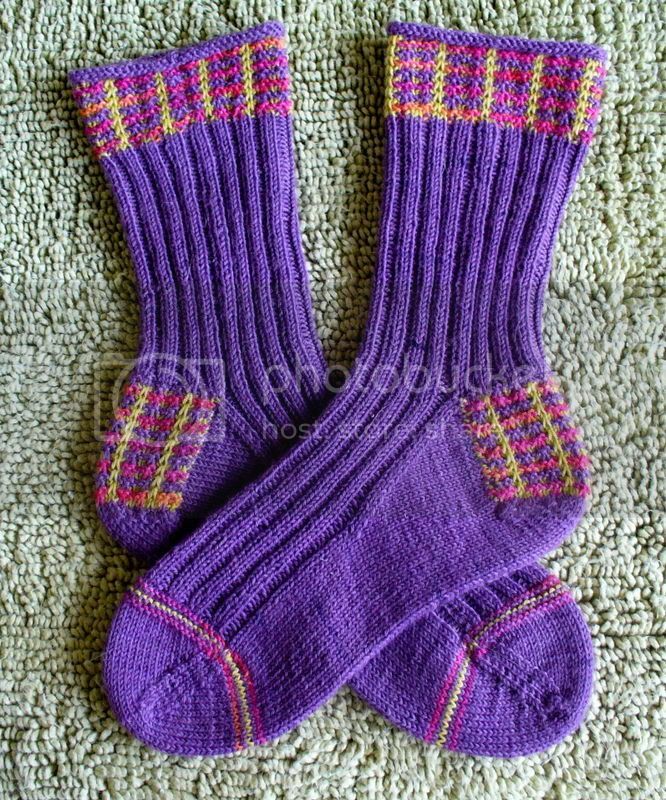 I love the socks, and I have to agree with about the photos on other blogs. I love to look up close and personal to everyone's knitting. When I click to make big and nothing happens it is dissappointing. I'm behind in the ABCs too. I keep thinking I'll get caught up but days just keep slipping through my fingers. 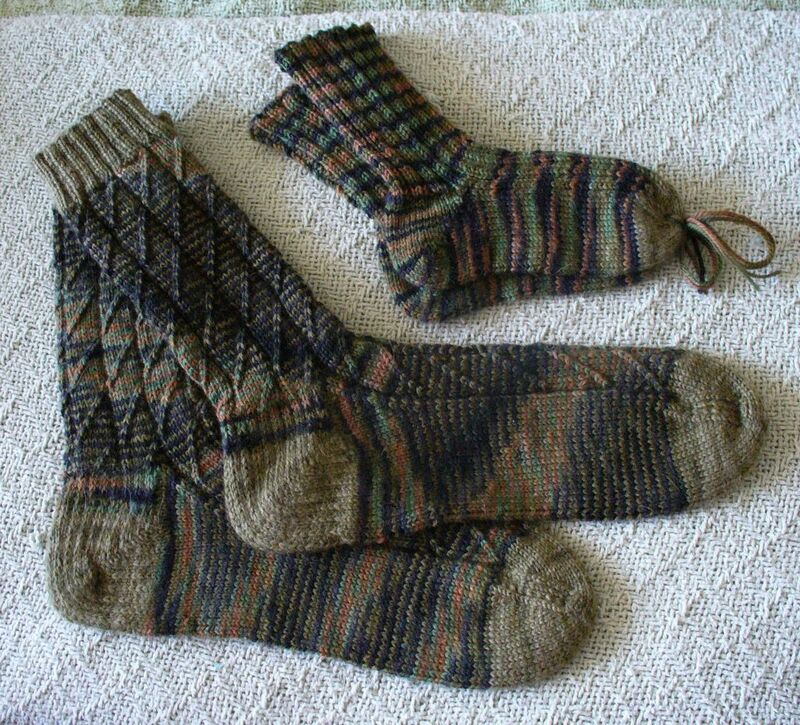 I love those camo socks - who'd have thought those colors would knit together so well? I don't know how to "embiggen". How do you make your photos do that? I just figured y'all knew some secret computer language that I would never be smart enough to figure out! I'm not sure typepad has a "let the photos get bigger" option. Love the colors of the Lotus Blossom Tank. So beautiful! Simply gawjeeus work, Debi! You do rock the knit, don't you? Thanks, BTW, for Loopy Ewe. I'm currently sans yarn fundage, but it's nice to know about good customer service! Wow, what a full-of-excitement blog!! Love/hate relationships with technology are a way of life for nearly everyne I'm afraid. Your sticktoitativeness is laudatory. 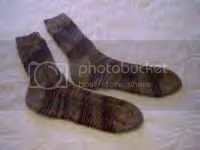 And the socks that you will DONATE are fabulous. What lucky, lucky recipients. And the shawl. I see that I am not the only person to have too many projects for one lifetime. I'm still trying to complete all UFO's. You seem to have a much better success rate than I do. Wow - when you bring the knitting content, you really bring the knitting content! I'm curious as to why you added a bit of flap and gusset on the heel of your modified Rob's Twisted Rib socks? What's the benefit and how did you go about doing this? 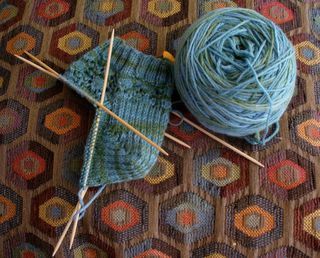 I'm curious, because I am working on similar socks with a short-row heel for a friend and want to make the best socks possible. I'd appreciate any help/insight you can provide. You can respond to nanc AT toysaregoodfood DOT com. Okay, what's with the cute little bow thingy on the toes of the kidlet socks? This is the second time I've seen that. I SO need to snorgle P-man. Wanna send him to CA for the winter? Thanks for the sock pattern! It's great that you are back online. The socks and the slippers are fantastic! 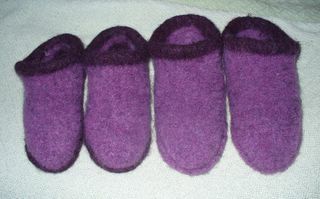 I keep saying I'm going to make felted slippers - I have the yarn (naturally) already - but have yet to get around to it. Maybe now that my feet are getting colder and colder, I'll get on that! They look great and the PMan is adorable as usual! Third, thank you so much for your kind words about The Loopy Ewe!!!! Deb it's so good to have you back...Someone's got to show me how to embiggen (tho' I'm pretty sure my photos are pretty big enough? Let me know! Love the felted slippers, but I think I'll refrain - I had too much trouble with the entrelac tote. P-Man is gorgeous as always! I have no clue how to make my pix embiggen (hangs head in shame), but if you click you go to Flickr where you can see them in any size you please. 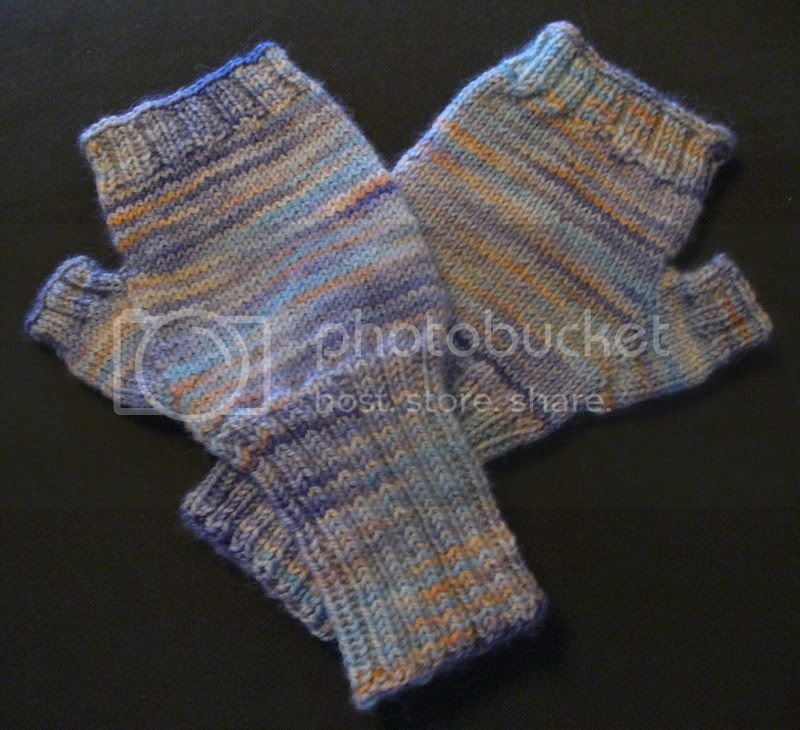 Also, I'd love to see the pattern for the Twined Rib socks, but couldn't find it on your sidebar. So how do you set the blog to enlargen pics on Blogger? 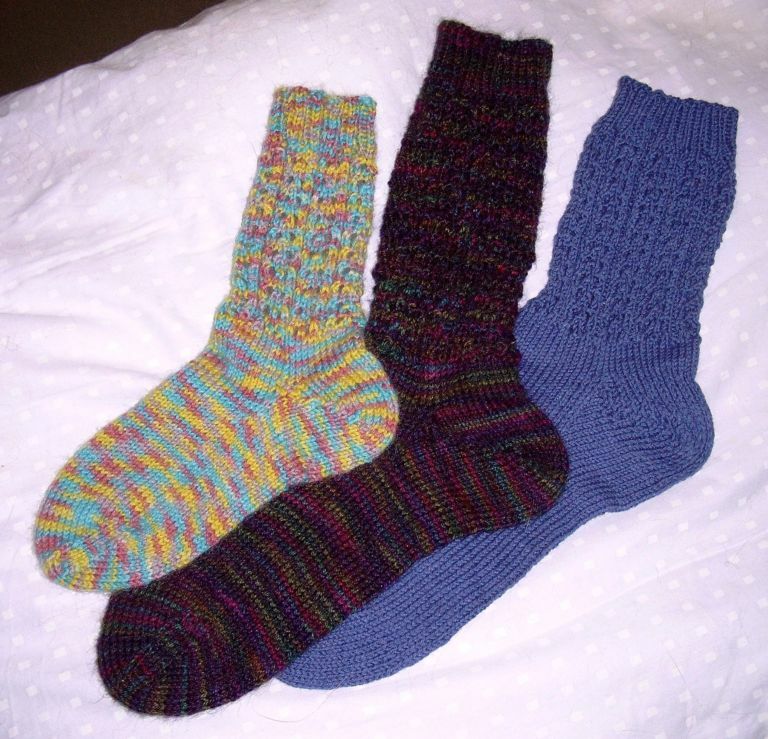 I think when bloggers say they can't find the Rob's Twined Sock pattern on the sidebar, it's not a regular link to an adobe PDF but rather Filelodge which won't let downloads happen unless you register for it. I'm having trouble retrieving the patterns off the filelodge.com site. Perhaps YouSendIt would be a good alternative. Thanks for sharing them. Wow, you've been busy! Great stuff!!! 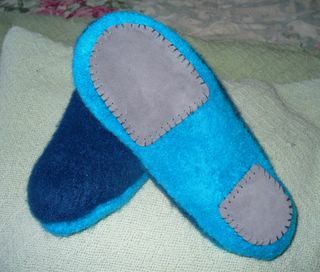 Did the slipper soles come with holes in them or did you have to create the hole with your needle? I've tried the full sole and they are tough to work with as well. I like your idea of the paint on. I'm with you, I like the enbiggen. 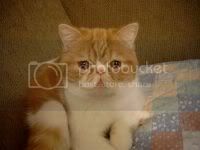 Your pic's are larger than some/most and I still enlarge them. Come on bloggers we want to see it ALL!! !